A vegetarian diet, especially one that includes fish, significantly reduces the risk of colorectal cancer, a large new study reports. These findings could lead to new strategies for cancer prevention. Eating a vegetarian diet with fish cuts colorectal cancer risk by more than 40%. In the Adventist Health Study 2, researchers had 77,659 men and women from Seventh-day Adventist churches nationwide complete well-validated questionnaires about 200 food items. In the March issue of JAMA Internal Medicine, Michael J. Orlich et al. report that after adjusting for many health and behavioral variables, vegetarians had a 21% lower risk of colorectal cancer than non-vegetarians. The New York Times wrote that mean intake in the entire population was very low, averaging about 2 oz/day, and 490 cases of colorectal cancer developed. However, some vegetarian diets were better than others. People who ate mostly vegetarian diets, with meat or fish up to 5 times/month derived little benefit. 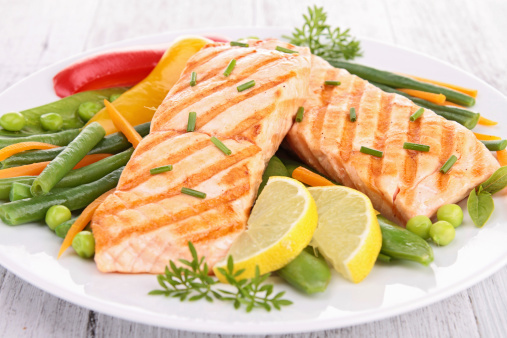 But pesco-vegetarians, who ate fish 1 or more times a month and other meats less than once a month, had a 42% reduction in risk for colorectal cancer, compared with non-vegetarians. During a mean follow-up of 7.3 years, 380 cases of colon cancer and 110 cases of rectal cancer were documented. The adjusted hazard ratios in all vegetarians combined vs non-vegetarians were 0.78 for all colorectal cancers, 0.81 for colon cancer, and 0.71 for rectal cancer. The adjusted HR for colorectal cancer in vegans was 0.84, in lacto-ovo vegetarians was 0.82, in pesco-vegetarians was 0.57, and in semi-vegetarians was 0.92, compared with non-vegetarians. Effect estimates were similar for men and women and for black and nonblack individuals. Are CMS Payments Associated with Numbers of Medicare Beneficiaries in Each State? What’s Wrong With Herbal Supplements?